In part I of my report from Alsace I visited the Grand Cru Hengst to meet 12 producers and taste 16 top wines. The following notes on 14 more wines really do represent some of the cream of all Alsace production. The notes are taken from two seminars conducted during ‘Millésimes Alsace’, the bi-annual expo of Alsace wines held in Colmar. The first set of seven wines were chosen by current and former holders of the title ‘World’s Best Sommelier’, each chosen as a personal favourite to represent, for them, exemplars of different Alsace wine styles. 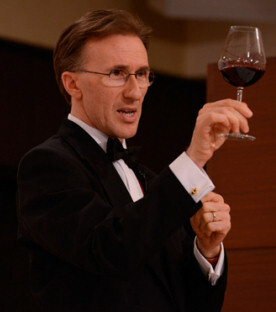 The wines were chosen by Paolo Basso (right, current holder of the title), Enrico Bernardo (2004), Olivier Poussier (2000), Markus del Monego (1998), Shinya Tasaki (1995), Philippe Faure-Brac (1992) and Serge Dubs (1989). Chosen by Markus Del Monego who pointed out that Crémant makes up 25% of all Alsace wine production. This is Pinot Blanc from a single vineyard on limestone. The wine is aged 60 months on the lees in bottle. Very nice nose, the bready yeastiness giving way to a little toast and butter, a touch of honey. It has some of the aged leesiness, a touch of soft cheese rind, lovely and complex. The mousse is very fine, and it bursts with flavour on the palate, lots of bright yellow plum, lots of lime, really zippy and fresh, with the soft cushion of the mousse giving lovely easy drinking approachability. Hints of hazelnut persist in a lovely wine. Markus suggested pheasant breast with a quince sauce as the perfect food match. 92/100. See all stockists on wine-searcher. Chosen by Olivier Poussier, this comes from 15-year-old vines planted on chalk and limestone, very low yield at 25hl/ha. Bright ruby core, quite a lot of smoke, quite a lot of charry oak notes at first, but also showing some mineral freshness and a touch of cherry fruit. Lovely freshness on the palate, with bone dry character, lots of tannin, but it is very fine and elegant. Served cool, it also shows very good acidity and the dry cherry flavour is delightful. Juicy and beautifully balanced, it is an inherently fresh and racy style, almost rosé-like, but with lovely balance. 90/100. See all stockists on wine-searcher. Chosen by Shinya Tasaki. This was actually a tank sample, to be bottled later this year. Lovely nose, lots of herbal notes, lifted and exotic, plenty of spice and sandalwood, a mango and lychee character. Something smoky and mineral too, and a hint of less ripe character, that touch of green leafiness again. Off-dry, there is a yeasty, wheat beer and clove touch here. It is very complex and distinctive, a touch of bay leaf, and a lovely core of sweet fruit. Delicious and extremely long, lovely dry mineral and salt acidity to balance. A really fresh and driving style of Gewurz. The food recommendation from Shinya was rare tuna or sushi. 92/100. See all stockists on wine-searcher. Chosen by Serge Dubs. A biodynamic wine made from Pinot Blanc, otherwise known as Auxerrois, which Serge noted was “Generally regarded as the poor relation to Riesling, Pinot Gris and Gewurztraminer.” This comes from Grand Cru Hengst (but as Auxerrois is not a permitted Grand Cru grape, the naughty “H” is the clue). It is extremely delicate and yet intense, with gentle floral nuances to stone fruits, and a nice creaminess. Gossamer light stuff, with lacework freshness to the acidity, just a little bit of residual sugar adding some sweetness, but the pithy freshness of lemon and the salty, stony minerality is delightful. Intense flavours and delicious length, precision and finesse. 92-93/100. See all stockists on wine-searcher. Chosen Enrico Bernardo. Schlossberg Grand Cru has granite soils. This wines comes from 65-year-old vines. It has a lovely touch of fig or something quince-like and ripe, but is also so fresh with a cut of green apple and mineral brightness and lightness. The wine is bone dry, with plenty of acidity really giving this attack and intensity, but there is something inherently sweet about the fruit, something obviously ripe and exotic with a touch of mango and pineapple. Long and shimmering stuff, and a quite beautiful young wine. 93/100. See all stockists on wine-searcher. Chosen by Philippe Faure-Brac. 45g/l of RS in this VT (Vendange Tardive=Late Harvest). From limestone and marl soils. Lovely pronounced minerality, the wax and the touch of paraffin, with bold apple fruit still present, and a grapey character. There is a delicacy of white flowers and touch of apricot. Beautifully balanced palate, it is off-dry rather than sweet, with such shimmering acidity cutting through the candied citrus and a nicely bitter little kumquat note adding savoury elegance. Lovely length and style. 92-93/100. Philippe’s suggested food match is foie gras or fish – ideally turbot or lobster with a cream and citrus sauce. See all stockists on wine-searcher. The second set of seven wines was a real treat: seven special vintages chosen by top sommeliers, Romain Iltis, Chief Sommelier of the 3-star L’Arnsbourg in Baerenthal, Lorraine, and Caroline Furstoss from Revue des Vins du France. Granite soil. Hugely powerful nose, so ripe and so full, with some overripe notes but bags of personality. On the palate it has a full mouthfeel, with lots of extract, lots of phenolic grip too, with melon skins and citrus peel, and into the mouth great power, great depth of smoke and nuttiness, and touches of glacé fruits. The acidity is lovely – not massive acid, but it has a lovely freshness and line that runs through the fruit, smokiness and nutty richness and power to the end. Delicious and big – don’t know the alcohol, but feels just a touch hot. 91/100. See all stockists on wine-searcher. Made in Vosges oak. Lots of truffle here, lots of spices and just a touch of creamy oak, but there is plenty of ripe and round peachy and apricot fruit there too. The palate is punchier than the Boxler, fresher, with a sour orange acidity and flavour, touches of coffee that come through to support, and a real sense of natural grip and concentration. Such a fabulous wine, powering through with immense length. 96/100. See all stockists on wine-searcher. Marl and limestone. Lots of botrytis in this year. Hugely glowing, burnished golden colour – just looks invitingly rich. Loaded with honey, but also with exotic spices, caramel, leaf tea and garrigue. In the mouth it is medium-bodied, with a delightful dried fruit character, some dried apricot and fig, and yet there is real freshness here too. Delicious dry extract, toasty, grippy, but the silk and the sweetness push through against those caramel and coffeeish notes. Deep and lovely, perhaps lacks the touch of complexity for my top, top score. 92-93/100. See all stockists on wine-searcher. From clay and limestone soils. Still a beautiful green colour here, and a lovely nose of beeswax and bay leaf, the limey fruit beneath is lovely and very pure. On the palate it has smooth, rounded flavours, but pin-sharp with such clean and clear flavours, lots of orange and lemon peel waxiness, and a long glistening finish. Fabulous stuff, and endlessly long, this still feels abundantly youthful and powerful. 94/100. See all stockists on wine-searcher. Still a mystery where Riesling’s sometimes ‘petrol’ notes come from – the ground, the grapes or the farming? This wine shows so little of it, but is focused on stone fruits and citrus, and a gentle oatmeal and smokiness. Tiny floral scents too. The palate is so dry, so fine, pure, linear, and wonderfully focused with so much ripeness but all buttressed, wrapped and constrained by that shimmering core of acidity. It is in perfect and amazingly youthful condition – so fresh and still so clear and lemony, with a touch of saltiness. 93/100. See all stockists on wine-searcher. Served from magnum (right). No botrytis in this year, very low yields but before Z-H moved to biodynamic farming. A much lighter colour, a pale green still. There is a leafiness to this, a herby and lightly vegetal aroma, with something yeasty and meaty too, in a complex nose that seems to have no sweetness – so different from the Weinbach VT, and possibly a little reductive. The palate shows a faint imprint of sweetness, but it has been consumed, subsumed, by the acidity, the herby, meaty concentration of this. Long and fascinating, but an unusual wine that is possibly more about intrigue than pure pleasure. Fascinating. 90/100. See all stockists on wine-searcher. “Wine of the Gods – at the end of the war we had no time to really work in the vineyards.” This was long before the Grand Cru appellation Kitterle, but Schlumberger were naming it on the label in the 1910s. Golden colour, with toffee and light truffle and mushroom notes, the custard richness melding with some ripe yellow apple. The wine has sweetness in the mouth, a delicious gentle character, the acidity gentle and the balance still good, sugar and acidity in balance, and still there is good fruit, with apricot and apple, and that little touch of vanilla. Still really long in the mouth. 92-93/100. See all stockists on wine-searcher.